Rudy’s mom again – he left out the best part! The rest of the story… We all stayed in this cabin last weekend for the Book Across the Bay ski race (see Rudy’s last post). 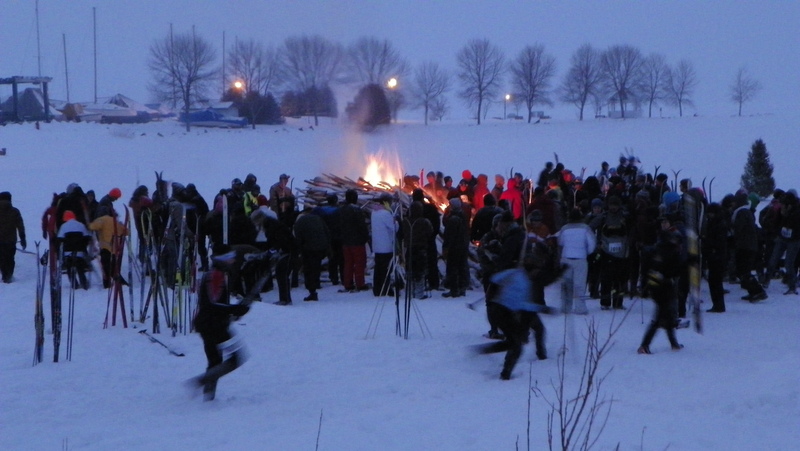 It was a 10k, cross-country ski race starting at 6PM. It was snowing and dark, the trail was lit with ice lanterns all across the bay. It’s really a great race. And, it wears you out. Rudy did it in 1 hour 14 minutes, beating his Dad for the second year in a row, by 3 minutes. We got back to the cabin and the kids all collapsed on their bunks. Some of them even fell asleep. But Rudy didn’t have a bunk – he had a quinzhee. Even so, I walked into the cabin and there he was, half asleep on a top bunk. We started teasing him. His quest is not always easy. He had to reach deep into his well of determination to eventually pull on his many layers, walk out into the darkness and crawl into his latest quinzhee. Yes, he slept outside. And no, I’m not just saying that. PS. He will be answering your questions that you sent in his next post!